Sorry for the radio silence from us lately. We haven't forgotten about you, we promise. Here's what's up with us right now. 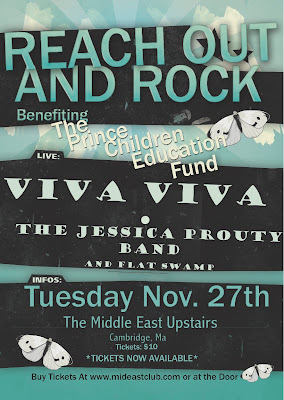 We're doing this benefit show for The Prince Children Education Fund at the Middle East Upstairs, Tuesday November 27. Tickets are only 10 buxxx and they go to a cause that you can feel good and fuzzy about. Help the kiddies & take in some rock and roll. Tickets are available online NOW! Aaaand... in case you're following along: we snagged a nomination for Live Act of the Year in this year's Boston Music Awards. We're stoked. Last year's show was way fun (and we nabbed an award that night, too). So...uh...if you feel like it....uh...maybe you could vote for us again this year? We'll just leave the link for that right over here... you can vote once a day, e'ryday! See y'all at the Middle East on the 27th.